I was asked to helm this year’s Gilbert & Sullivan production at The Earlville Opera House back in April, and my name was well down a list. My search for a collaborator began immediately, and it took until just a couple of weeks ago to get John Krause to agree, for which I am grateful (he was in my top 3, along with the vocal arranger for Broadway’s 2014 Best Musical Tony winner.) In all, I asked 24 music directors if they would work on the show – we were two days from canceling when John called. I’ve never directed a Gilbert & Sullivan piece before, but I have a book with their complete lyrics on my shelf which I started reading right away. 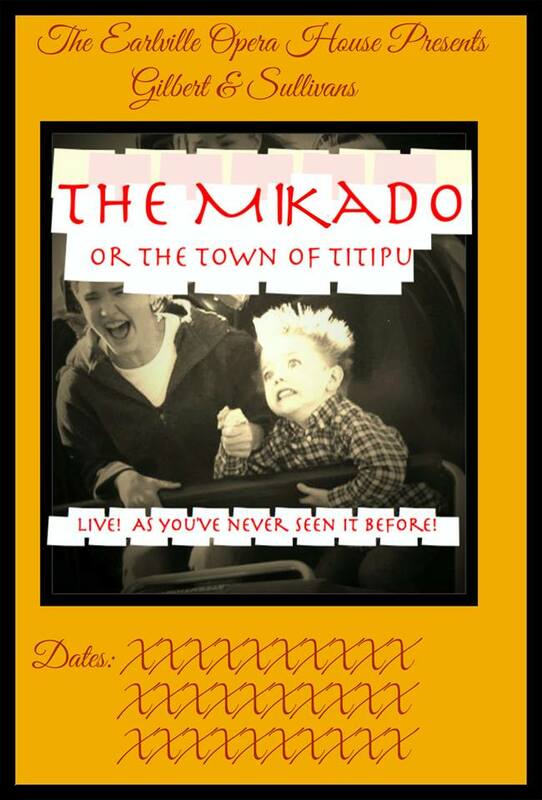 I chose The Mikado because 1) It hadn’t been done at Earlville in a long time; 2) I thought it would be an easy show to sell; 3) I laughed as I read through it; 4) I loved the music when I listened. The Mikado is arguably the grandfather of modern musical theater. By some estimates it has been continuously performed somewhere in the world since it was written, in 1885. The Japanese setting was a device that allowed W.S. Gilbert to more effectively satirize English customs and politics – it was not intended to be taken literally. Notable updates of The Mikado have set the piece in an English Cricket club, and in the 1940’s with a jazzed-up score. Our cast is coming together. Some have turned down roles and won’t be part of the production. Those who remain and who are joining even now are an eclectic group of performers who will do the show justice. One is coming from Clarks Summit, PA, several others from the Syracuse area, some from the Earlville area and many from the Mohawk Valley. I am excited by the possibilities. My intention for our upcoming Earlville performance (and a hoped-for encore in Herkimer) is to “surprise and delight” the audience. The music is primary – we’re going to sing the hell out of this piece. However, the icing on the cake is the characterizations, and the laugh-out-loud humor of the plot. Of course the songs will be well sung, but our audience will remember how they laughed.